Descubra las delicias culturales y los deliciosos bocados de Brooklyn en un recorrido culinario por el vecindario de Williamsburg. 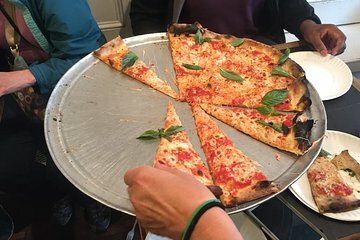 Con una guía experta, profundice en la rica historia culinaria de la zona mientras visita instituciones icónicas para degustar sabrosas golosinas como helados caseros y la mejor pizza en Brooklyn. Deleite su paladar con degustaciones intercaladas con arte callejero vibrante y vistas panorámicas del horizonte mundialmente famoso de Nueva York. Las opciones vegetarianas también están disponibles en este tour tentador. Disfrute de muestras de delicias locales. Aprende sobre la rica cultura culinaria de la zona con tu experto guía epicúreo. I thought the barbeque restaurant was really delicious. The ice cream, bagels and chocolate was tasty, I would definitely visit Williamsburg again. Justin led out group over a 44 square block hustle. We started with perogies and cookie from polish shop, then bbq from folks who came from Oklahoma, then pizza from "THE BEST PIZZA" which was unique in offering a sesame seed crust white pizza as well as the traditional margarita, then bagel bombs which where filled with bacon cream cheese or for alternate spinach/artichoke to accommodate diet issues, then artisan chocolate, and finished with ice cream which you were able to choose your flavor. A lot of walking at a brisk pace, he did a good job of making sure we stayed together. He started by identifying any dietary issues, there were 3 in our group and he was very good about ensuring those issues were accommodated at all the stops One was lactose intolerance, two were no pork. We all enjoyed the variety of food choices and loved the history lesson. Kate was awesome. Definitely a highlight of our trip and we would go to another of her tours. Great walking tour of Williamsburg. Lots of history and great food stops! Walter was an amazing guide! I really enjoyed our tour guide, Walter. He was very knowledgeable about local Brooklyn history and also enthusiastic about the area since he is a native. The only reason I wouldn't give this tour five stars is because the amount of food you get was paltry. I'm an experienced food tour consumer, having been to dozens around the US. This is the first tour where the food is truly sample sized one bite and you don't get much for your money. I've been on many food and history walking tours. With that said a tour guide can make or break the experience. Our guide was just ok. The guide navigated us from place to place and helped hand out the food tastings but did not offer up much history or cultural aspects of the area. Food was plentiful, but nothing special. Guide was friendly. About a 2 mile walk which was great considering the types of foods consumed pizza, bbq, cookies, ice cream, bagel bites stuffed with cream cheese, perogi. If you are a foodie, this is not the tour for you. Fabulous. Great walk, tons of history. Plenty of food. We learned so much about Brooklyn, which was the goal!